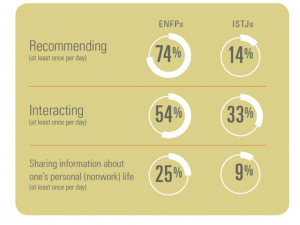 One recent study grouped participants by their Myers-Briggs personality types, then surveyed them about their social media habits. As you might expect, there were some significant differences among these personality groups when it came to their relationships with social media. While Myers-Briggs breaks individuals into 16 distinct categories, each person will fall into one of two main types: (E) extrovert or (I) introvert. Across a number of topics, extroverts were much more likely to be positive about social media and actively engaged. Introverts, on the other hand, were slightly more likely than extroverts to regard social media as a waste of time. When it comes to specific interactions on Facebook, extroverts were 1.5 to almost 2 times as likely to engage than introverts. 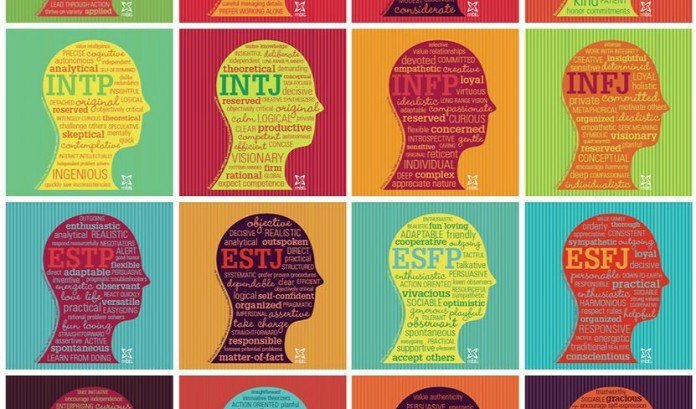 These differences became even more significant when the personality types were broken down into the specific 16 groups, with extroverts of the ENFP type and ISTJ type introverts showing the most dramatic differences. 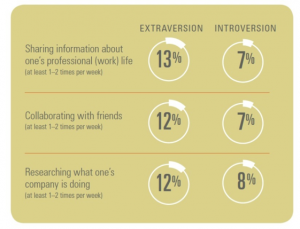 While it may seem entirely intuitive to expect extroverts to be more engaged in social interactions than introverts, many of us tend to regard our social media activities differently than, say, how we would approach our communications in a social group. If you imagine the different sensitivities and styles that you would employ at a cocktail party, it’s important to remember that your social media communications also cannot all happen in the same voice and at the same level. The extroverted party-goers will share at great length if you’re willing to listen, but the introverts may need some introducing and to be prompted with questions before they’re ready to share. While the introverts may tend to watch more than interact at the party, it seems the same is true on social media. When you receive comments, likes and shares on your social media posts, it is entirely likely you’re hearing much more from your social media extroverts. Don’t forget that your more introverted followers may be listening, even though you don’t see it in likes and shares. Your willingness to respond to comments is particularly important to the more introverted followers in your group, as this encouragement may reward them for their involvement and encourage them to engage more. When considering the different types of personalities in your audience, it’s also good to remember that your posts should be varied. You may “hear” more from your extroverted audience, but your introverts may be reacting to other types of posts without sharing back. Of course, different types of companies and organizations will attract a different blend of the 16 personality types among their customers, prospects and social media audiences. Arjuna uses powerful predictive analytics algorithms to help clients understand their customers and followers so they can design the marketing messaging that is most likely to be effective. “We’ve seen that clients are often surprised when they can see the make up of their audiences through our Persanalytix software,” said Adam Treiser, Arjuna’s Chief Executive Officer. “This information can be very effective in helping them truly ‘speak’ to their customers and find more like-minded prospects. The results can be dramatic and very rewarding,” he added. Are you ready to learn more about who’s listening when you speak? Click here to see how our predictive analytics platform, Persanalytix, works and the type of micro-level insights that clients are able to gather about their social media audience.